Gene grew up in the cutthroat streams of northern Idaho. He is a FFF Certified Casting Instructor and life member, and a member of his local TU chapter. 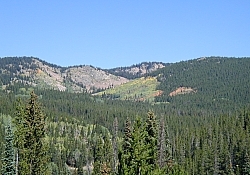 Favorite spots include the Bob Marshall Wilderness (MT), Kelly Cr. (ID), The Shoshone River (WY), and what's left of the St. Joe (ID). Notes: The Ice Golden Stone, mentioned in his story below and the first Stimulator pictured above, is Gene's variation on the Yellow Stimulator. Gene uses Hareline's Ice Dub for the body. While traipsing up and down the spine of the northern Rocky Mountains in search of cutthroat trout, I’ve come to rely on the Stimulator in all its variations of size and color. From a size 18 in brown for early winter stones to a size 4 in black and orange for the giant salmonflies of the Rockies, this pattern has been a go-to fly for all types of water and all seasons. The quest can start in February, when a size 18 in black on a Mustad #94840 imitates snowflies on the Kootenai River. 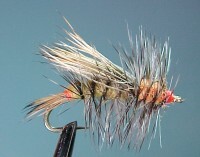 In March, for early winter stones on the North Platte I've used a size 16 in brown. 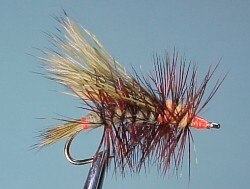 And, in April on the Clarks Fork and the Bitterroot, a size 12 or 14 tied in olive imitates the Skawlas. Early summer, right behind the runoff, brings out the salmonflies and, if you can catch up with them, some very large trout looking for a big easy meal. A large black and orange or Royal Stimulator will catch fish slashing at the large salmonflies. A favorite trick of mine is to fish a large Stimulator like a steelhead fly right down a current seam, just under the surface. I’ve been rewarded with some very nice fish using this method. On the tails of the salmonfly hatch, the Golden Stones begin to fly. When this happens, a yellow Stimulator or my variation, the Ice Golden Stone, gets the call. Along with the Golden Stones, willow flies and small chartreuse stones become available. Seldom noticed by fishermen, but a favorite of trout, these small bright green and yellow stoneflies are available to the fish throughout the summer. A small yellow, olive, or bright green Stimulator can be just the ticket. High summer means “Hopper Time”. A large yellow Stimulator with the float, drown, and swing tactic has been a constant producer on north Idaho’s Kelly River. With late summer the backcountry streams from the South Fork of the Flathead, down through Idaho, Montana, Wyoming, and Colorado come into shape. Now the size and color is secondary to just plain having a couple of pockets full of high floating, durable flies. Most of these streams fish well until it’s no longer possible to access them. 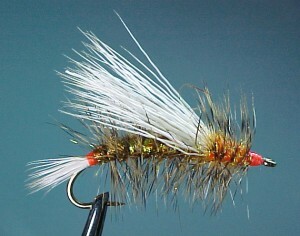 When the snow starts to fly and pile up, it’s time to start tying. After all, you only have a few months to get all the sizes and colors you’ll need for next season finished.